While he didn’t rule out a return to welterweight one day, Till looks set to mix it with the best in the 185lbs division. Darren Till following his victory over Stephen Thompson in May of this year. DARREN TILL SAYS his defeat to Tyron Woodley in their welterweight title bout at UFC 228 will likely be his last appearance in the 170lbs division for quite some time. The Liverpool native has endured well-documented struggles with his ability to make weight and exceeded the 170lbs limit when preparing to take on Stephen Thompson in May of this year. 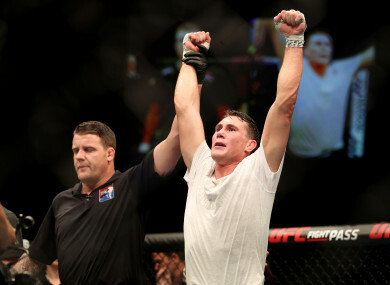 Till had no such issues when he faced Woodley – weighing in at 169lbs for his first ever UFC title fight – but defeat has caused him to rethink his tactics. “I’m a big dude for welterweight to be honest, so that’s probably going to be my last fight at that weight,” Till said in his column for PaddyPower.com. “Welterweight isn’t fully gone for me, but I’m going to be happy going up to middleweight now and I’ll be strong at that weight not having to cut as much weight. I’ll have a few fights at middleweight and you never know, down the line if Woodley is still about then I can have another go at him, that’s a rematch I want. “It’s not that I can’t make the weight. I’m just a big lad so I just have to be on such a strict, regimented diet and being honest, I don’t like doing it. Robert Whittaker currently wears the crown in the middleweight division, with Jacare Souza, Luke Rockhold and Chris Weidman all high-profile names who may welcome Till to the higher weight class. It remains to be seen whether Yoel Romero is a viable option for Till. The Cuban was set to make the jump to light-heavyweight after he missed weight before taking on Whittaker for their middleweight title showdown in June. Romero was touted to fight Alexander Gustafsson for the light-heavyweight strap before Jon Jones returned to the fold in the last week. Email “Darren Till officially switches focus to UFC's middleweight division”. Feedback on “Darren Till officially switches focus to UFC's middleweight division”.